Sing the arati of Lord Hanuman, the destroyer of all that is wicked, an exalted hero in Sri Ram's sportive play on earth. His massive power makes even mountains shake. Neither sickness nor impurities can come close to his devotees. This son of Mother Anjani is immensely powerful. He always provides help and protection to the good. Lord Ram entrusted brave Hanuman with the task of finding Sita, for which he jumped to Lanka and burnt the capital. The impregnable fort of Lanka and the deep moat of the surrounding sea could not hamper his progress. He succeeded in bringing news of Sita. He burned Lanka, slayed the demons, and completed the work of Lord Ram and Mother Sita. When Lakshman was lying unconscious, Hanuman went quickly for the life-saving sanjivana herb. Bringing it by early morning, he saved Lakshman's life. [Ahiravana kidnapped Lord Ram and Lakshman and took them to the nether world.] Hanuman went quickly to the realm of death and tore apart Ahiravana's arms. 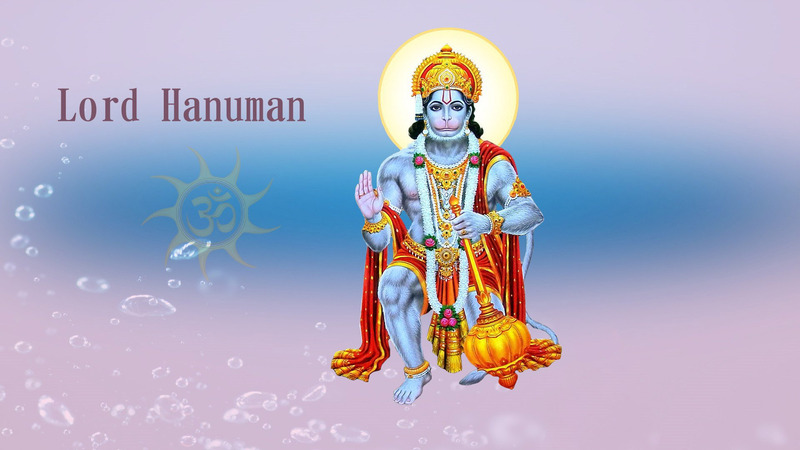 Hanuman's mighty arms are ever engaged in protecting the good and slaying the demons. All the gods, humans, sages, and seers aver perform his arati and chant 'Glory to Hanuman' with great enthusiasm. Mother Anjani performs the arati of her beloved son, burning camphor on a golden plate. Whoever sings the arati of Lord Hanuman attains the highest state and dwells in Vaikuntha, the highest heaven.